150 students, alumni, faculty and staff celebrated at the home of Orlando FC. 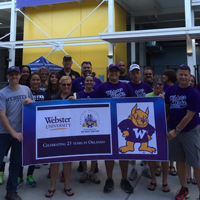 Webster Orlando Metro celebrated their 25th anniversary and Webster's centennial by hosting 150 students, alumni, faculty and staff at a crucial Major League Soccer match between Orlando City FC and the Montreal Impact. The evening's festivities began with a tailgate party, group photos with the Gorlok and a private Webster cheering section. Everyone came together to celebrate 25 years of the Webster metro campus serving the Orlando community and the 100th anniversary of Webster University. The Orlando Metro campus location has a diverse student body consisting of students from South America, China, Thailand, the United Kingdom, India, Africa as well as U.S. students from all over central Florida. These Gorloks had more to celebrate by game's end: Orlando's 2-1 victory was a critical boost in their race with Montreal for the final playoff spot in the MLS's Eastern Conference.